Helps to understand program more easily. Helps to define input, output and processing sections of program. Helps to easily debug the program and act as analytical tool. Represents complex algorithm in concise form of documentation. According to use and application of the flowchart we have two types of flowcharts: system flowchart and program flowchart. System Flowchart: It describes the sequence of processes to perform specific work. It explains the total flow of data inside the system. 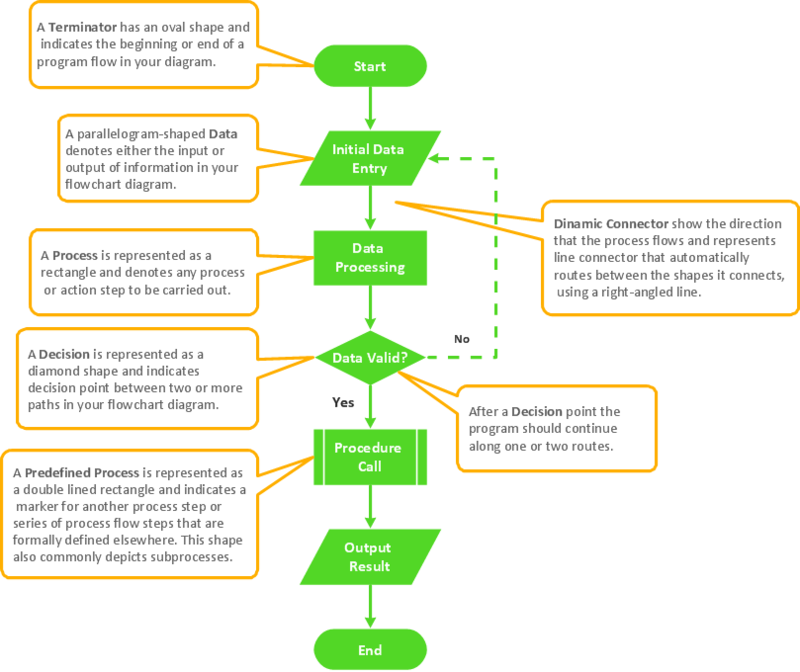 Program Flowchart: To represent the program, we have to use standard diagram called program flowchart. It shows the flow of instructions to solve the problems. It is used to make logical structure diagram of program. Analyse the input, process, storage and output of the program. Use standard symbols and arrowhead to the direction of flow of data and instructions. We should use easy word which can be easily understood by other programmer. There should be a list of activities inside each symbol. It should express all sections like input, process, logical and output. It should not be any programming language oriented. It is easy method of communication to represent program. It serves as a guide for program coding. It is easier to understand than program and algorithm. It is program independent so applicable for all types of programming languages. It represent all the components of program like input, process, logic and output which makes easy to develop the program. It cannot replace all types of logic used on the computer program. It takes long time to represent all module of computer program. It is not suitable and be complex for big problem. The step by step solution of a problem in a picture form is known as flowchart. Flowchart is one of the most important and oldest techniques to depict an algorithm. Flowchart It represents all the components of program like input, process, logic and output which makes easy to develop the program. What is a flowchart? List the types of flowchart. Flowchart is a graphical representation of program solving steps so that it makes clear about the program. The concept of flowchart was given by John Vonn Neuman 1945. Differentiate between system flowchart and program flowchart. 1. System flowchart gives complete processing mechanism and cannot be converted into program 1. Program flowchart gives the problem solving method and can be converted into program. Example: Organizational structure of a college. Example: Problem to calculate area of triangle. What are the common guidelines (properties) of flowchart? The flowchart should have only one start and ending points. Flow lines shouldn't intersect each other. Flowchart should not contain the programming language. The flowchart should be neat and clear for the user. 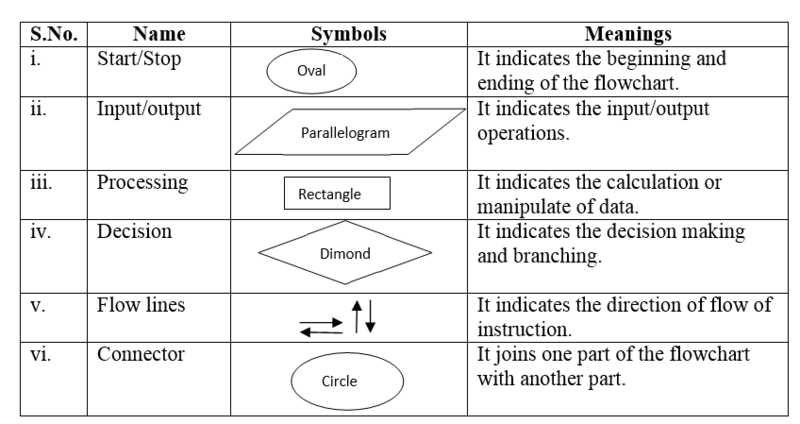 List flowcharting symbols along with their meanings. Write any two disadvantage of flowchart. It takes long time to prepare to proper flowchart. 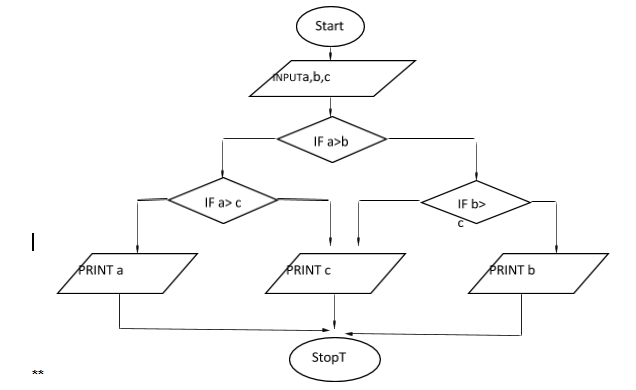 Translation of flowchart into program is sometimes difficult. Write algorithm and flowchart to display area and circumference of circle. Draw a flowchart to find greatest number among three numbers. 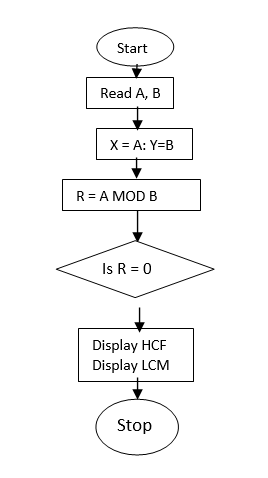 Write algorithm and flowchart to display H.C.F and L.C.M of given to numbers. Step 4 : Divide A by B. Step 5 : Is remainder zero? If yes, go to step 7. Step 8 : Multiply X and Y and divide by HCF. And assign result to LCM. What are different symbols used in flowchart? The basic flowchart symbols are: 1. Start and end symbols, represented as lozenges, ovals or rounded rectangles, usually containing the word "Start" or "End", or another phrase signaling the start or end of a process, such as "submit enquiry" or "receive product". 2. Arrows, showing what's called "flow of control" in computer science. An arrow coming from one symbol and ending at another symbol signifies flow passes to the symbol the arrow points to. 3. Processing steps, represented as rectangles. Examples: "Add 1 to X"; "replace identified part"; "save changes" or similar. Input/Output, represented as a parallelogram. Examples: Get X from the user; display X. 2. Conditional (or decision), represented as a diamond (rhombus). These typically contain a Yes/No question or True/False test. This symbol is unique in that it has two arrows coming out of it, usually from the bottom point and right point, one corresponding to Yes or True, and one corresponding to No or False. The arrows should always be labeled. More than two arrows can be used, but this is normally a clear indicator that a complex decision is being taken, in which case it may need to be broken-down further, or replaced with the "pre-defined process" symbol. The step by step solution of a problem in a picture form is known as______. ______ describes the sequence of processes to perform specific work. To represent the program, we have to use standard diagram called ______. ______ is used to make logical structure diagram of program. What represents complex algorithm in concise form of documentation? Any Questions on 'Flowchart '?